Christmas is just around the corner. Decorating for Christmas can be fun but often burns a big hole in our pocket. Let’s not burn our pockets any further and DIY our very own ornaments instead. 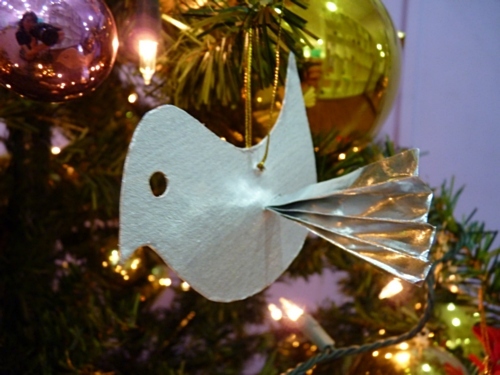 DIY Silver Bird Christmas Tree Ornament. I drew the bird template on a drawing block. We recycled the hardboard that comes on the back of every drawing block. We used that hard board to make the bird. I got the kids to use the template to draw the outline on the hard board and cut for them. The older kids cut out their own bird. Get them to paint the bird using silver poster colour. I cut silver paper and fold them accordion style. Read here if you don’t know what is accordion fold. Use the folded paper as a guide to how long you’ll need to cut a slit on the bird. Slip the paper through and spread open the wings.